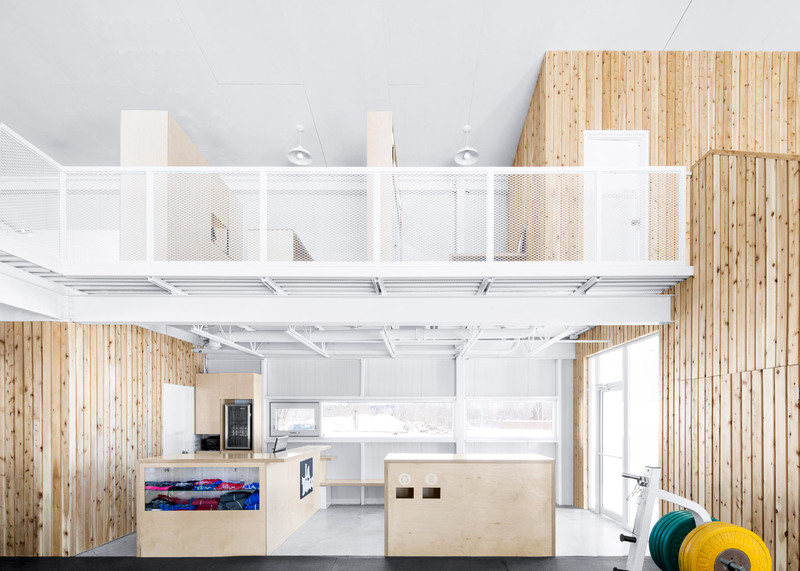 Canadian studio Architecture Microclimat has created a simple athletic facility in Quebec with a lofty ceiling that enables gymnasts to hang high in the air (+ slideshow). 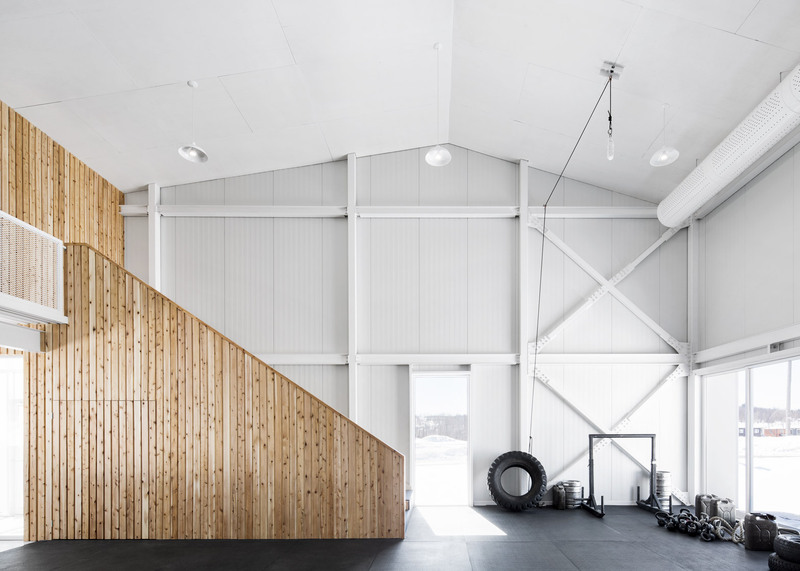 Called La Taule, or The Slammer, the new light-filled gym is located in Waterloo, in Quebec's Eastern Townships region. 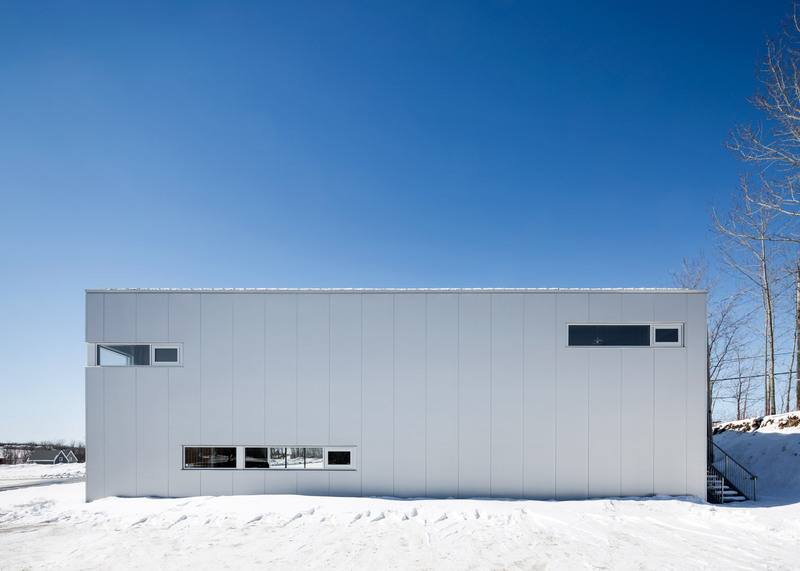 Rectangular in plan, the 390-square-metre building features an asymmetrical gabled roof. 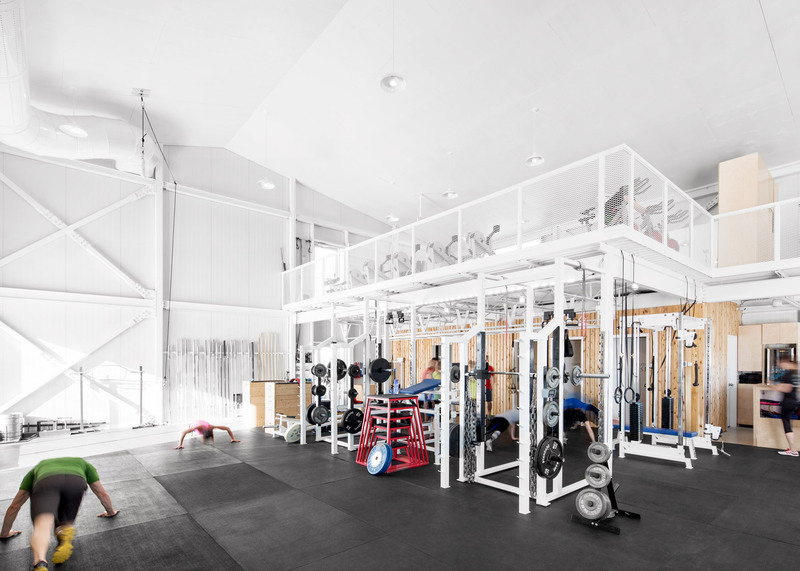 The facility contains an open floor plan that can accommodate body builders, gymnasts and fitness enthusiasts. 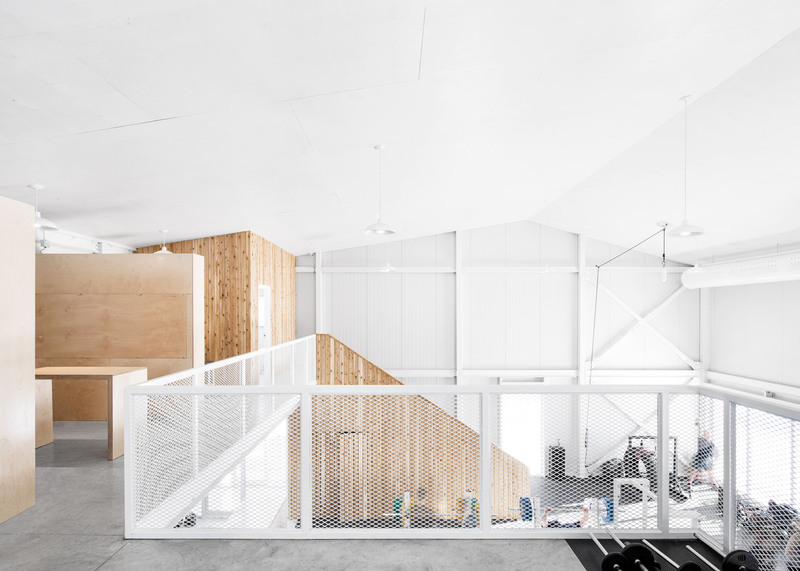 "Every element of the project was conceived for those who use the centre, from the mezzanine's structure that supports the horizontal bars to the wide stairway that can also be used for training," said Montreal-based Architecture Microclimat. Gymnastic rings are suspended from the ceiling and allow athletes to hang 7.6 metres in the air. The interior is mostly white and grey, with sporting equipment offering pops of colour. To create a sense of warmth both inside and out, the firm paired metal with various types of wood. "The combination of red cedar, cherry wood and steel helps create a warm and inviting space that lends itself to the members' sense of belonging," the studio said. Prior to its new home, the sports centre was housed in a former prison. "In 2014, the founder purchased a property in a developing sector of Waterloo in order to build a centre better suited to the activities of the centre's clientele: both elite and amateur athletes," said the firm. The sports facility is intended to play a role in the neighbourhood's revitalisation. "When La Taule was inaugurated in the spring of 2015, one could sense the pride of local residents and future users of the centre," said the studio. Externally the structure is clad with metal panels and wood slats. Large glass doors and several bands of windows enable natural light to penetrate the interior. A large portion of the property was left open in order to create an outdoor training zone. In the summer, the building's sliding glass doors link the indoor and outdoor activities. 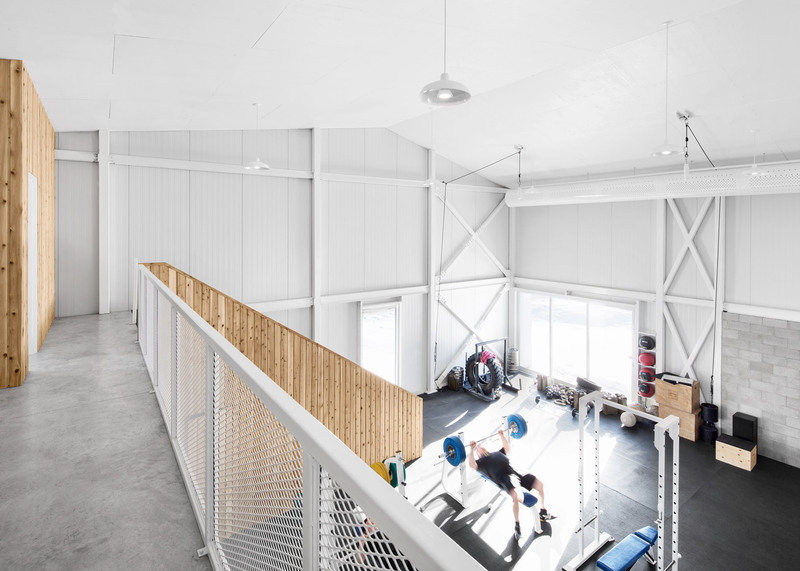 The project received a 2015 Grands Prix du Design in the fitness centre category. 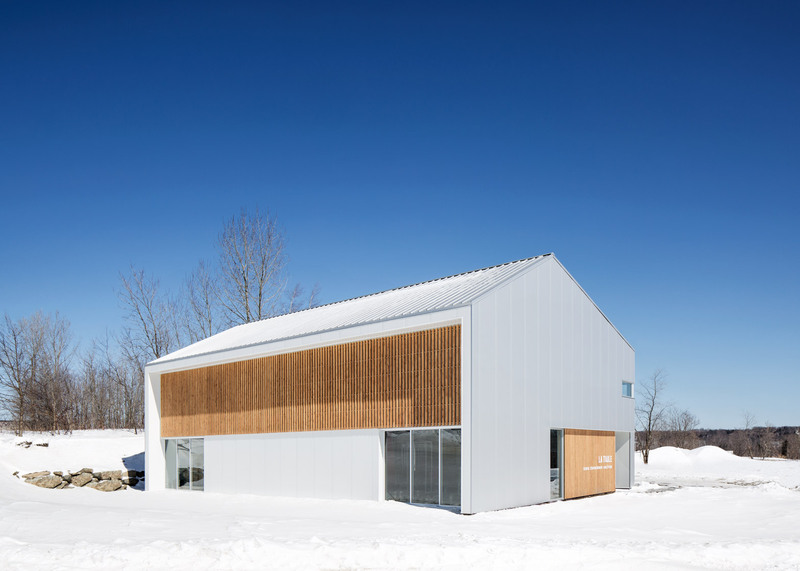 The awards programme recognises exemplary work by Quebec-based designers and architects. 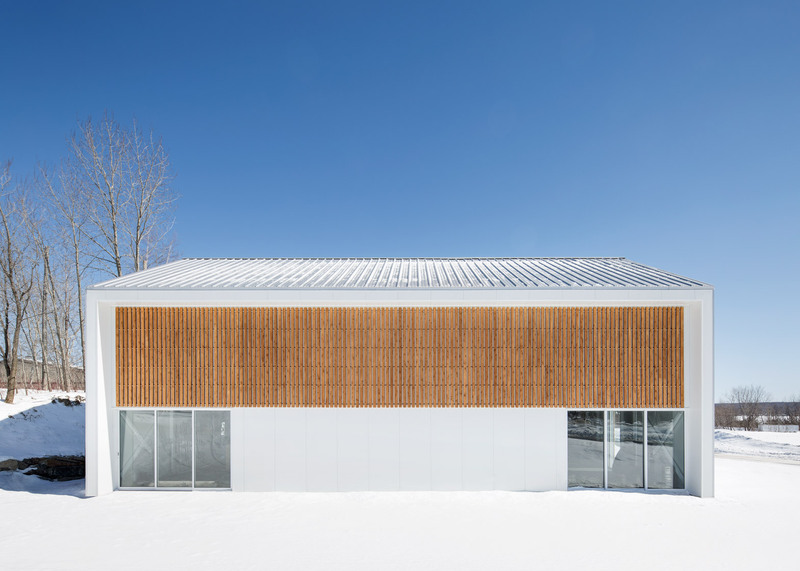 Other recent projects in eastern Canada include a hydroelectric plant with timber-slat walls by Atelier Pierre Thibault and winter follies constructed along the frozen beaches of Lake Ontario.